One of the most productive phenomena in technology since the advent of the Internet has been to adapt the network model to other eligible platforms. Ultimately, the packet switching network really isn't much more complicated than the post office. Information is addressed at its origin and delivered to that address. The only true differences are the volume of information, the network traffic's sequential nature and the speed at which it arrives. Radio and the Internet were destined to come together like peanut butter and chocolate. It was only a matter of time before microprocessors were integrated into both analog and electronically controlled radio systems. The resulting advances amplified the strengths of both and resulted in a wide array of technologies industry, first responders, the military and government rely on today. One of these key technologies is called "trunked radio." It essentially combines the packet-switching model of the transmission control protocol with automated frequency aggregation. The result is a broadcast radio system capable of both person to person and group to group transmission and reception, all controlled by a central processing unit. In a trunked system, a talkgroup is assigned to a particular frequency called a control frequency. When a member of the group transmits a message, the control frequency uses an internal microprocessor to allocate bandwidth from a shared block of frequencies allocated for use by that talkgroup. When the transmission concludes, the control frequency releases the shared resources back to the pool. Like a packet switching network, the control frequency in a trunked radio system redirects radio traffic to a new frequency depending on the identity of the transmitter. On the Internet a packet is routed to the destination system indicated by the packet itself. 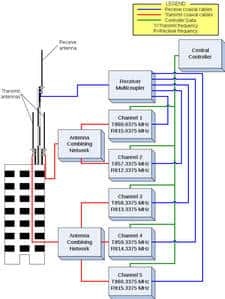 The key advantage to this kind of switching is the ability for many users to make use of the same set of frequencies instead of allocating a permanent or semi-permanent frequency to each station so their transmissions do not interfere with broadcasts already underway. The purpose of both a packet switching network and a trunked radio system is to create an abstraction layer in the communication between groups of computers or groups of radio users. When a talkgroup in a trunked system is established, it is not necessarily assigned a particular frequency or group of frequencies. Any member of the talkgroup, however, can expect to reach the other members of their group regardless of when or for how long they transmit, however, because the microprocessor inside the radio knows that a transmission from a particular talkgroup is meant to be received by the same talkgroup. This same kind of abstraction is what makes a many-to-many computer network possible. If the network did not specifically identify each machine and have a mechanism for routing traffic to and from a specific address, then every computer would receive every packet sent. This would make it impossible for more than a handful of machines to operate, as the network would become oversaturated with packets. This is the situation trunked radio also seeks to avoid. When seconds count in an emergency, confusion can be deadly. This is especially true if those responding to an emergency are widely dispersed and trying to do too many things at once. In situations like this, communications are important. Precise communications are crucial. This is an area where a technology like trunked radio shines its brightest. Consider a fire battalion. One group is fighting the fire itself. Another is engaged in a rescue operation in the basement. The third group is securing flammable materials near the location of the original fire. If any of those three groups are either cut off from their own members or end up crossing communications with one of the other groups, it could lead to several seconds of delay and confusion that could put both the lives of the firefighters and the lives of civilians in danger. Trunked radio solves these problems by automatically routing communications to and from distinct groups while making it virtually impossible any two talkgroups can end up on the same frequency. In times of very heavy loads, a trunked system can become oversaturated just like any other network. However, a microprocessor can switch frequencies instantly, so unless the majority of the total talkgroup population all starts transmitting at once, the chances no frequencies will be available are vanishingly small. Internet technology and radio are natural allies. From the advent of wi-fi, where computer packets are transmitted by radio, to the invention of voice over IP where "radio" is transmitted by computer networks, the two technologies have grown considerably in just the last two decades. While these new combinations achieve ever greater things, innovation continues. Trunked radio systems are yet another example of how two complementary technologies can be combined to produce a sum greater than its parts. In What States Are Police Scanners Illegal?